Super7 teams up with Hasbro to bring the most popular Japanese giant robots of all time to the Super Shogun format! OPTIMUS PRIME and other Autobots and Decipticons will be realized as jumbo-scaled, 24” tall retro-bot complete with rocket punch! These will be among the largest TRANSFORMER collectibles ever produced! 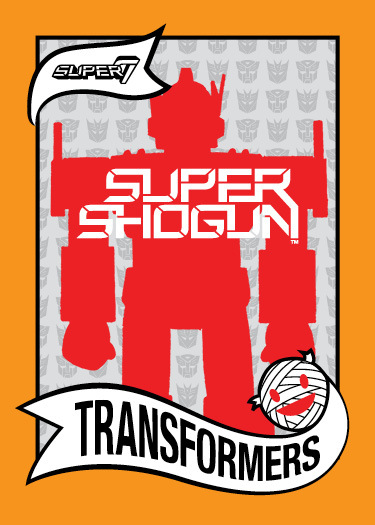 As part of this multi-year licensing agreement, Super7 will also produce TRANSFORMERS merchandise in a variety of categories, including Designer Japanese Vinyl Figures, retro-themed Glassware, Designer T-Shirts, and Limited Edition Art Prints! Stop by Super7’s booth (#4729) at the San Diego Comic Con for teasers of what is to come in 2013. Teaser image shown; not actual product. Pending licensor approval. Transformers © 2012 Hasbro. All Rights Reserved.